You call always count on Jan to put on a good show! Yes Eric more points coming your way if you are home in early May - I hope to emulate the contest style operating and give out the points myself… I am in Czech 1st May for 7 days with GI4ONL again. We are OK8CDX and OK8VM. 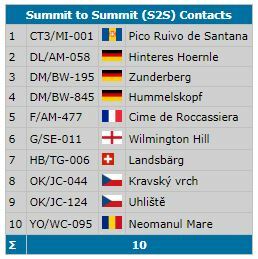 Mainly OK/VY region summits with some ST, JC and PA region also - using mainly CW and also SSB. By the way, very congrats for all those new ones. I found doing 5 in a day in October was challenging and was starting to run out of daylight. OK I was soft and having breakfast in the hotel and skipping breakfast would have gained me an hour more. Doing 7 in a day at this time of year is good going. Especially as I had nice sunny WX and no possibility of snow or ice etc. What limits me is that the 3rd time in a day I have to set up the antenna is when I begin to lose the will to live. The joy of taking down and packing for the 5th time knowing that you wont be doing it for at least 12hrs is the joy of real multi-summit activation! Yes Eric - Jan is out again. I missed him on his first summit OK/JC-057 as I stayed in bed until 0800 today. He’s operating in the area where I am going in May. It’s a good new Phil, follow your marathon next May you and Victor Last year you had spoiled us! There’s a report and photos if you have not seen it Eric. Oh my . . . I’m looking forward to my own retirement to be able to miss SOTA because of a power nap! Hi Andy ! yes seen your report on “activation reports” but can’t find your logs on SMP ? Just to confirm how many worked (I’m working only new one and sometime I give points). Use the DB, it works better!